In Austria and Germany Mother's Day is celebrated on the 2nd Sunday in May. Mother's Day is on a date that is constantly changing. 2011 it is the 8th of May, 2012 Mother's Day will be on the 13th of May. There is another big celebration in May in Austria and Bavaria - the 1st of May. The 1st of May is Labour Day in continental Europe. Especially in the rural areas this is the time to put up the maypole. May Calendar Sheet - with vie of a maypole - Maibaum - and blue sky, even the trees are already starting to get leaves, spring did arrive. 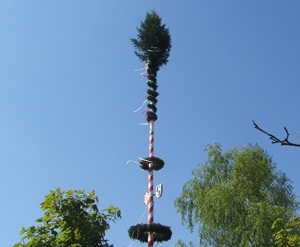 The celebration accompanying the putting up of the maypole is the first fair in the spring for many villages. Usually there is a marching band, usually a brass band, beer tents and much popular yet tables and benches outside in plain air. Like typical for a country fair there might be some shooting galleries, many sweets like candy floss and cinnamon roasted almonds, sometimes carousels and other fairground attraction. As soon as the maypole is put up and standing tall – a procedure that can take up some hours – there might be some dances around the pole, some competitions and climbing up the maypole. You can easily print out MiaDeRoca calendar sheets. We are always happy about feedback. You can of course link to our free calendar sheets, refer to them on your website or blog.